Kiwi Lumber Premium Decking is a top grade decking product which we have been proudly manufacturing for many years. Like all of Kiwi Lumber’s timber, it is produced from a sustainable resource – plantation grown radiata pine. Why choose Kiwi Lumber Premium Decking? Produced from New Zealand radiata pine – a legally harvested sustainable resource. Less expensive than imported hardwoods. CCA H3.2 treated for a 50 year Limited Guarantee. Also available in Clear and Merch grade and Kiln Dried. Boardwalk and Smooth profiles have a Premium graded face. Griptread Profile is graded on the griptread face. 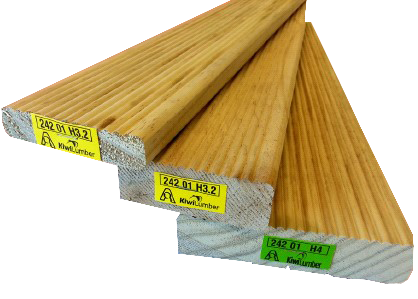 Kiwi Lumber decking is supplied as Treated Wet, unless otherwise requested. The majority of our decking timber is not re-dried after treatment, and in order to get the best results it is recommended you follow the correct procedures before the timber is fixed in place. Note, most decking sold in NZ is not re-dried following treatment. Once on site all timber should be filleted or decking can be laid face down over joists for a minimum period of 10 days depending on the weather conditions. By air drying these products for a period it will allow excess moisture in the timber to dry out and the timber to acclimatise to the conditions. Individual boards must be dried evenly to ensure sizing remains consistent. If the above process is followed shrinkage and movement of these products will be minimal. Kiwi Lumber is not responsible for the quality of work carried out on the goods by the consumer and is not responsible for the design or construction of any structure that the goods are incorporated in. Check local building authorities for specific building requirements. If you require Kiln Dried decking please call Kiwi Lumber to discuss your requirements. Grip tread decking is intended to be laid with the grip tread face visible. The timber is graded on the grip tread face. To improve the durability of your deck we recommend that a decking oil be applied as per the manufacturer’s recommendations.